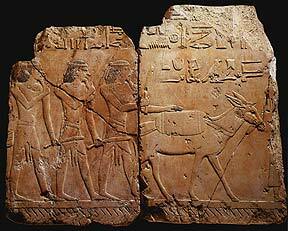 (at the bottom left of the picture can just be seen the remains of the Mortuary temple of Mentuhotep II (11th Dynasty). Although the majority of the scenes here have been destroyed, some do still survive - most notiably a scene of Tuthmosis III dancing before the god Min, and also a scene showing the journey of two obelisks down the Nile (see were erected at the temple of Karnak). 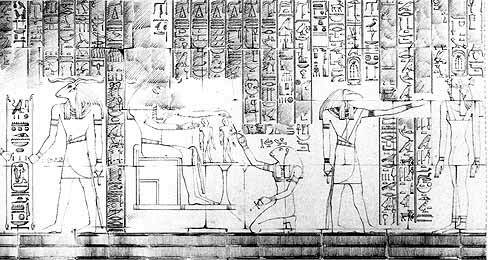 Any scenes of Hatshepsut have been destroyed, but scenes showing Tuthmosis III still survive (he is shown worshipping Seker). The chapel also has figures of many gods - Anubis, Nekheb, Uaset, Amen-Ra, Harmachis, Osiris (but Anubis occurs the most - in one scene Hatshepsut (now erased) makes offerings to him). These scenes are a repetition of scenes carved on the walls of the temple at Karnak and show Hatshepsut's divine birth (these scenes are now much damaged, mostly due to a vengeful Tuthmosis III, but also to Akhenaten who had the images of Amun-Re erased as part of his religious crusade). The Queen is then shown with midwives at the time of the birth, various gods also attend the birth (including Meskhent the goddess of births), after the birth two Hathor goddesses suckle the baby and its astral self. 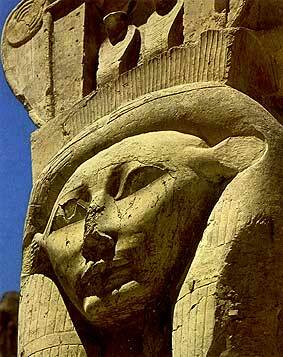 Finally the goddess of history, Safkhet, makes a record of Hatshepsut's birth. 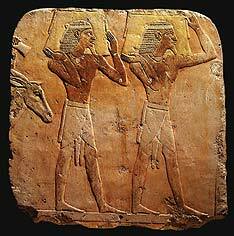 "Arriving at the goodly way into God's Land, journeying in peace to the land of Punt". "Why have you come into this land, which the people of Egypt do not know? Did you come down the ways of heaven, or did you sail upon the sea and upon the water's of God's land? Or have you trodden the path of the sun? As for the King of Egypt, is there no way unto his majesty that we may live by the breath which he gives?" The houses appear to have been built on stilts as the water seems to come right up to the steps. 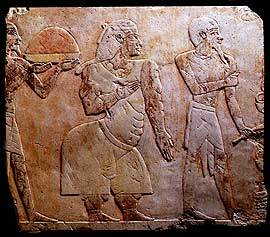 The people of Punt then present the Egyptians with incense, gold rings and other valuable items - the Egyptians then give a feast in honour of thanks to the Chieftain of Punt. "The loading of the ships very heavily with the marvels from the land of Punt; all goodly fragrant woods, heaps of myrrh-resin, with fresh myrrh trees, with ebony and pure ivory, with green gold of Amu, with cinnamon-wood, khesyt-wood, with ahmut-incense, senter-incense, eye cosmetic, with apes, monkeys, dogs, with skins of the southern panther, and with natives and their children"
Other scenes then show the boats on their triumphant return to Egypt, thirty-one incense trees have been brought safely back along with cattle, incense leaves, skins, chests of gold, panthers, and other animals along with silver, lazuli, malachite and other precious stones. 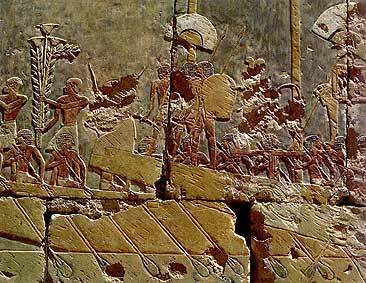 In a festival scene, soldiers run forward carrying branches of trees along with their axes. Tuthmosis III is shown presenting a sacred oar to Hathor, Hatshepsut dances before Hathor, Hathor licks the hand of an enthroned pharaoh. In the shrine of the Hathor Chapel, Hatshepsut is shown suckling one of Hathor's udders, and at the end of the chapel Hatshepsut is shown seated between Hathor and Amun-Re. 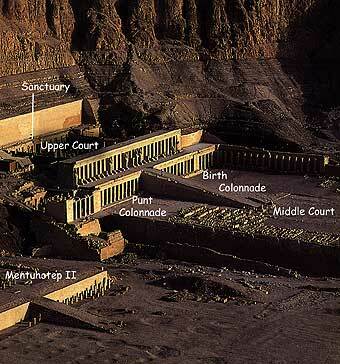 The name of Hatshepsut in this upper level has in most places been replaced by that of Tuthmosis III. 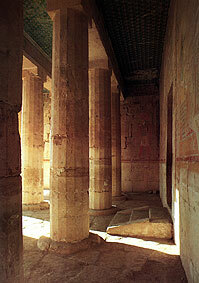 The Upper Court consists of niches in the wall, in the middle is a doorway which leads to the inner sanctuary. 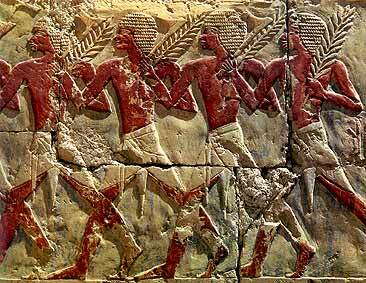 The decoration inside consists of scenes of gods (Harmachis (there is also a limestone altar to Harmachis - any other gods near to this altar were destroyed by Akhenaten - Harmachis was as a form of the Aten) , Amun-Re, Min), once more any figures of Hatshepsut have been destroyed. There are also scenes of Tuthmosis I and Queen Senseneb (Tuthmosis I's possible mother - if he was a son of Amenhotep I) making offerings to Anubis. In here there are various scenes of offerings to Amun-Re; Hatshepsut and her daughter Raneferu kneel before the barque of Amun-Re; Hatshepsut, Tuthmosis III and the Princess Raneferu sacrifice to the barque of Amen-Re. The most inner room of the Sanctuary was re-built in Ptolemaic times and scenes honour the deified Imhotep and Amenhotep son of Hap. 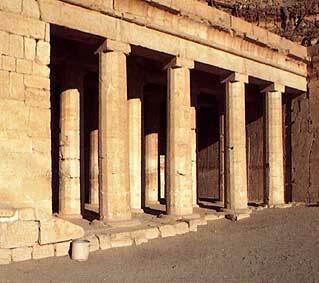 The Mortuary Temple after Hatshepsut. 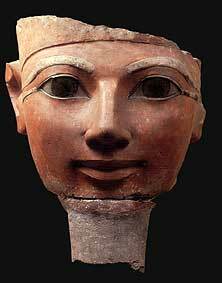 After Hatshepsut's death, Tuthmosis III replaced her image with his own - or erased her image completely as detailed above. Akhenaten then attacked the image of Amun-Re during his religious 'crusade' against the old gods, some additions to the temple were made by Ramesses II, Merneptah inscribed his name on the walls, in the Ptolemaic Period made some repairs to the temple (and mistook the temple to be in honour of Imhotep and Amenhotep son of Hap). Finally a Christian Monastery was built upon the ruins which left little of original temple visible. 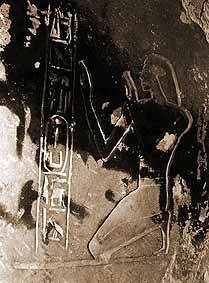 Many burials are also to be found placed around the temple - in the 21st / 22nd Dynasty a cache of High Priests (163 mummies) was buried a few yards to the north of the temple.